Screenwriter and game designer Allen Wolf’s enjoyable debut novel focuses on a young autistic man’s search for love. Twenty-four-year-old Shawn, a highly functioning autistic computer programmer for an online dating service headquartered in Manhattan, also contends with synesthesia, a condition that makes colors have sounds to him. He yearns to find his soul mate and get married while his grandmother is still alive, but his quest is difficult because his social awkwardness is frequently mistaken for rudeness. Romances are often cut short once his autism is divulged. His grandmother cooks dinner for his dates, and his older brother dispenses relationship advice. Ironically, both of them are avoiding issues in their own lives. When Shawn meets Violet, a prostitute whom he believes is an actress, he soon feels he has found someone whose “colors sound right to me.” As she greets Shawn on the steps of City Hall to obtain their marriage license, he tells her, “Your dress sounds like humming birds.” This unlikely couple appears ready to soar, yet they still must confront prejudices and difficulties. By turning conventions of contemporary romance on its stilettos and swapping out the typical sassy, fashion-obsessed female protagonist for an autistic male who reads jokes from index cards, Wolf puts a fresh spin on the genre. 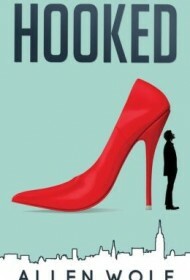 Adapted from his award-winning screenplay, Hooked shows signs of its origins with snappy dialogue and humorous, well-staged scenes. At times, however, that same cinematic flavor doesn’t translate as well to prose, particularly in the beginning when the backstory is reported somewhat flatly. Lackluster accounts of several first dates, for example, would likely work more effectively as a film montage. Nevertheless, the novel’s pace picks up as the plot moves forward and Shawn’s innocence and optimism become compelling. A sweet and entertaining romantic comedy, Hooked touches on autism and the power of faith. It will appeal to any reader who enjoys a blend of quirky characters, humor and drama. BlueInk Heads Up: Wolf, who is involved with charities to fight human trafficking, promises to donate a portion of the book’s proceeds to this cause. Author Platform: The screenplay for Hooked has won numerous awards, including the Screenplay Award at the Las Vegas Film Festival. It was a Top 5 Finalist for the Kairos Screenplay Competition, a Top Feature Screenplay in the Cinequest Screenwriting Competition and a semi-finalist in the Final Draft Big Break Screenplay Contest. Wolf wrote, directed and produced the psychological thriller In My Sleep, which won multiple festival awards, including Best Picture and Audience Award. He is also a multiple award-winning board game creator.